Just over 3 years ago Jackson got hooked on something… Remember this? Ah, his beloved white blanket… or “geek/geeky” as it’s been referred to. 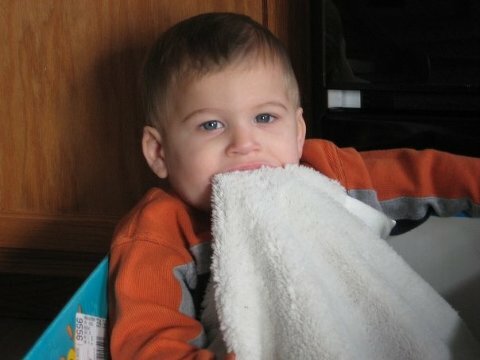 His brothers latched on to certain blankets shortly after Jackson staked claim to all of the white ones (Ty went for the three green blankets and Chase the three Winnie the Pooh blankets his great grandmother had made). All three boys refer to the blankets as their “geekies” or “geek”, but only one boy insisted on shoving the blanket in his mouth. When he turned 2 we worked a new white blanket into the rotation, because the other two were so vile and nasty. 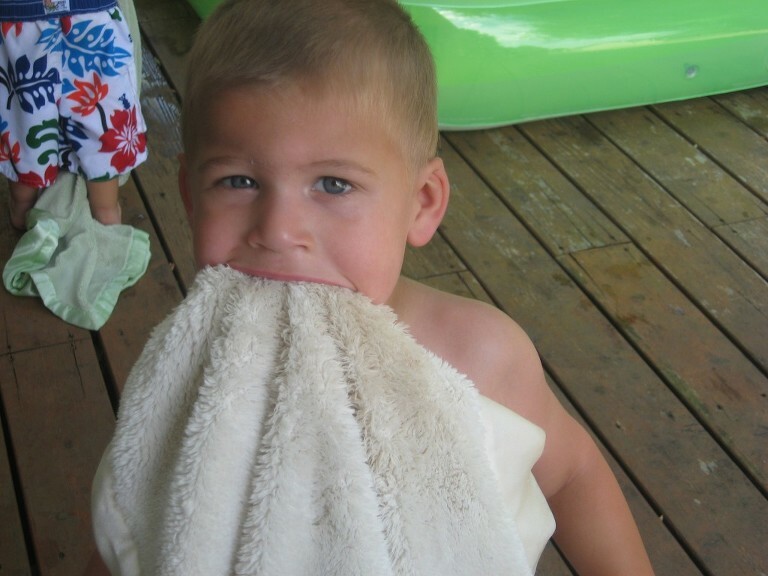 When he turned 3 we broke him of toting a blanket everywhere and restricted it to nap time (which was short lived after they turned 3) and bed time. The rest of the time, the blanket was hung up, out of his reach to, uh, air out. We felt badly that Jackson was now without something to cuddle during quiet time, like his brothers (we weren’t taking their blankets away because they weren’t chewing on them and as a result, shifting their jaw lines). So we bought Jackson a couple of “soft geeks” as he called them. Those blankets were to be used during the day when the white one was out of reach. He’s never attempted to chew on the “soft geeks” so we felt like we had success there! Shortly before Christmas Nick and I were discussing how Jackson was nearing 4 and a half and still chewing on those nasty things, and we really needed to break him of the habit. We devised a plan and decided to set it into motion on January 1st. We told Jackson he could pick out any prize he wanted as a reward for giving up his precious white geek, and he told us he wanted to be surprised and he wanted the prize wrapped in wrapping paper. I think the sight of Christmas presents was going to his head! On the morning of January 1st we told Jackson it was time. If he could go 20 nights without his white blanket then he would get the prize (that was now wrapped and on display on top of a kitchen cupboard). We would keep track on the calendar, by drawing a smiley face each day he completed. If he managed to do all 20 days in a row he would get his prize on the day of Lily’s birthday party! Then he fell that night and cut open his chin and needed stitches. Darn! Nick and I thought “there’s no way he’s going to want to go to bed without it now”, but he surprised us and announced that he really wanted his prize on Lily’s birthday. Here we are on February 1st, and still no white blankets for Jackson. Woohoo! I guess that whole “it takes 21 days to change a habit” thing is really true. Awesome, Helen! So glad that worked for you! As with so many things I read here, I’m filing that away! 🙂 I don’t remember hearing about 21 days to break a habit, either, but that makes sense.